Good combination, TT. I am still waiting (not very patiently!) for my hydrangea flowers to open - I don't think they are going to be blue this year, they look white! I love heucheras too and they seem to like my back garden. I've been battling for weeks, to keep mine watered ! What a wonderful marriage they look lovely together. Agree 6d definately a marriage made in heaven they look wonderful. By the way TT erigeron in full flower hope it will seed itself, thanks again. Hi Sixpence.... marriage.... that's a good word...Lol. Can you put the branches into damp compost ? That's beautiful TT, as you say a great combination. Lovely TT. Is that a hebe in the background? Love the combination of colours. yes ... I give my hydrangeas lots of water... thirsty plants ! beautiful! I have had one now for 5 years and has NEVER bloomed :( any suggestions?? Hi Heartnsol57 ... Thanks ..
thanks Terratoonie, I will try that! Do you know what variety that is? 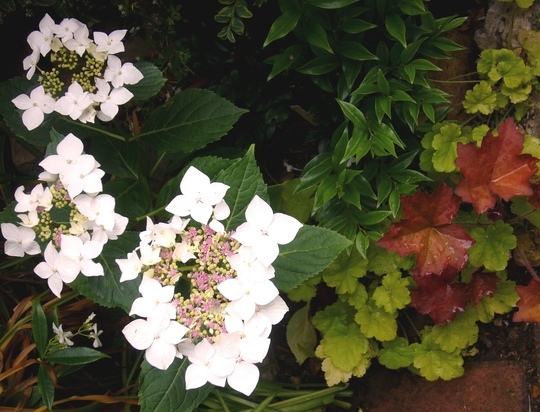 I really like the lacecap hydrangeas but there are only a few varieties that do well where I live. The hydrangea above is a mystery plant I purchased from a stall at a dog show.... so unfortunately I don't have the name ..
21st July, 2010 "Welcome Rain.. Yes and No"
29th July, 2010 "Garden Guests".